i got to hang out with my lovely friend pup on thursday, after trying to plan something for a week. 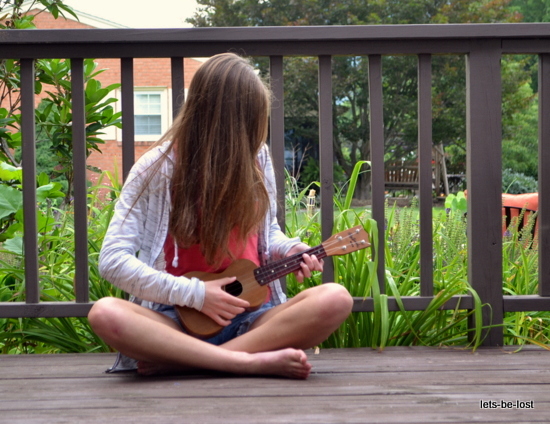 we picked her up at nine and then hung around my house, doing typical teenage girl stuff. like making sweet, sweet music with my ukulele, ocarina, and flute (it actually sounded pretty awful, but we were having fun, so whatever); emptying my wallet of money and throwing 30+ bills around my room; experimenting with milkshake recipes; testing our flexibility; updating her blog’s design, etc. (mostly) normal things. ah, yes. there we are. we decided to go to the mall, to try and find a birthday present for our friend. we stopped at a couple stores, and it was actually really fun. at books-a-million, i found two books about pup: they were called short and loser. 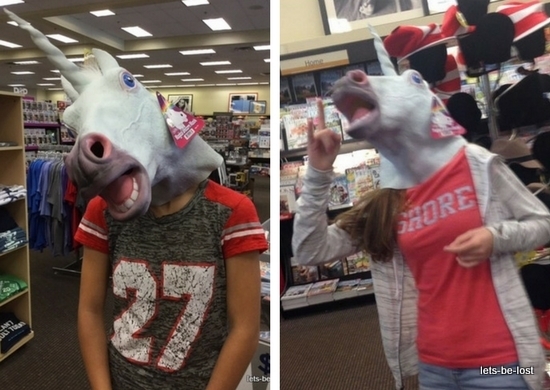 and i spotted a unicorn mask and kind of freaked out. i think these are the sickest things ever, so of course we tried it on. we decided that at my wedding, my love and i will wear these for the pictures. i hope whoever i marry is cool with that. me, holding a mug that looks like the colossal titan’s face: hey, kelsie, look at this. it’s as pretty as you are. we found some superman socks with little capes attached to them. my friend q had some like that, and he wore them to co-op nearly every day. i think something must have happened to them, because he hasn’t worn them for a long time. i kind of wanted to get some new ones for him. 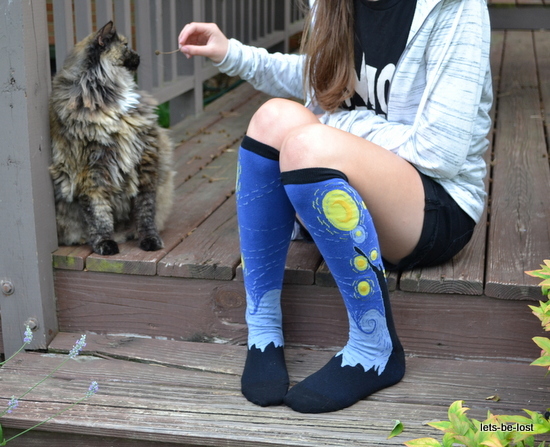 i found some cool socks, though, which i ended up getting. we stopped at a kiosk that sells phone cases, and the worker pointed out one of the camo ones and told us that they were popular among the ladies. he was pretty funny and helpful, but we didn’t find anything nice. there were some yankees ones and a creepy duck. pup said she was scared to go into hot topic. apparently she walked by it around halloween, and saw a goth kid whom she mistook as a vampire. but i finally coaxed her into going in, and she decided that it was ok once she saw all the disney and harry potter things. while we were in there, SING by my chemical romance started playing. i flipped out and followed pup around the store, performing the whole thing for her dramatically. i hope i embarrassed her. 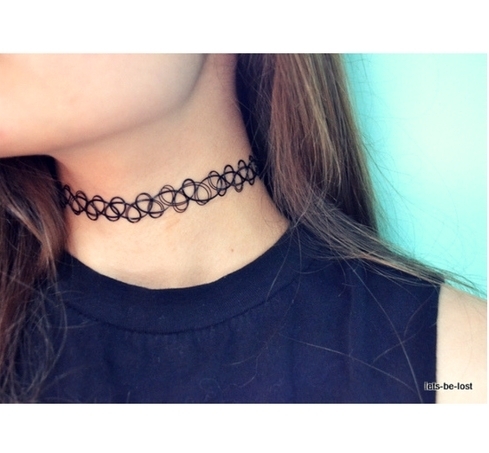 every time that you lose it sing it for the world then we made our way over to claire’s, because i hadn’t found a nice choker at hot topic and was hoping they would have one. i picked a very simple one, and pup and i wandered around the store, looking at the flower crowns. when we were getting close to leaving, pup found some pretty bracelets near the register. we ended up getting six of them, and they’re tight enough to not be annoying. my mom eventually texted us to see where we were, and then we got lost in the parking lot because we couldn’t find our car. there were a couple of guys using a jackhammer on the pavement, and i don’t think they were supposed to be doing that. oh well. 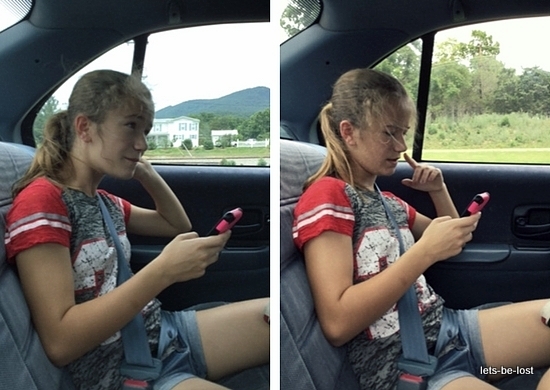 when we were driving pup to her grandma’s party store, she posted a bunch of really awful pictures she had taken of me on instagram. she’s literally the worst person in the world. but i posted that picture of her in the unicorn mask as revenge. she’s one of the weirdest, most amazing people i have ever met. and even if she doesn’t stay in my life forever, i’m so thankful for every moment i’ve had with her. so this was kind of a weird post, but i don’t think i’ll regret it. i want to save as many photos and stories and inside jokes and adventures as i can, because one day, the people i love might leave, and i need more than just memories of them in my head. p.s. i just updated my about page. so go check that out. first, of course, you need to pick flowers. 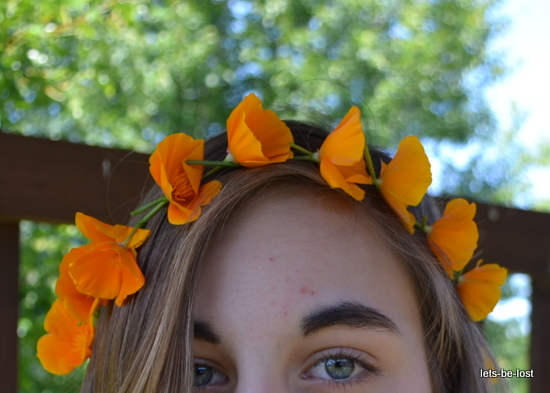 the best ones for making flower crowns with are dandelions or clover, because their stems won’t break as easily. most flowers will work, though. 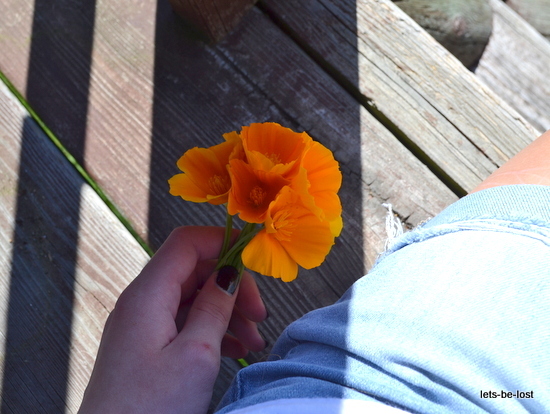 i chose california poppies. 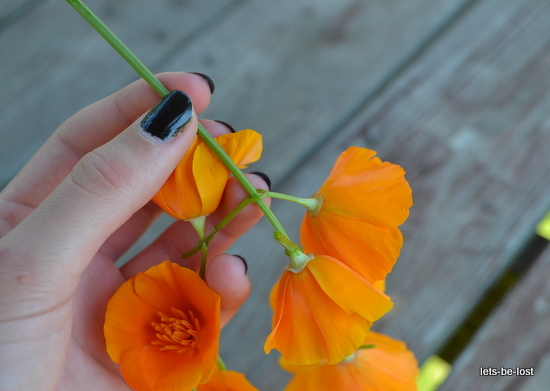 start by taking one flower and using your fingernail to make a hole in the stem. how far up the stem you make the hole will change the appearance of the flower crown. if the holes are near the top, the blooms will be closer together, making the crown look fuller. but that method uses up more flowers. if they’re near the bottom, the flower crown will look more loose and relaxed. it will look pretty either way, so it’s really up to how you want it to look, and how many flowers you have. take a second flower and put its stem through the hole in the first flower. 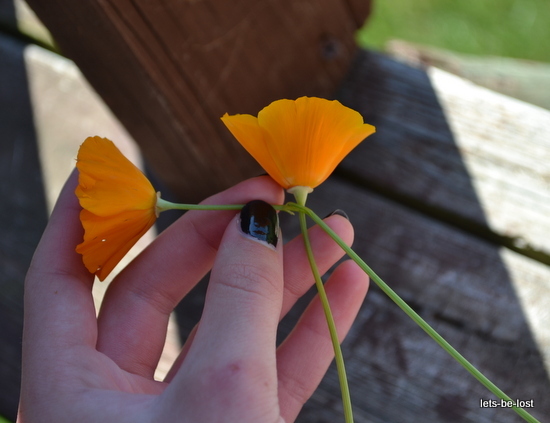 make a hole in the stem of the second flower, and thread a third one through it. 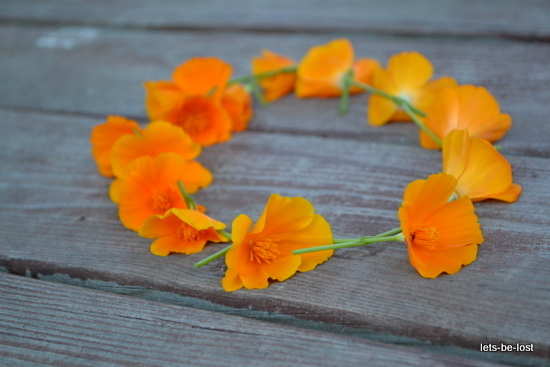 keep going until the chain of flowers is long enough to wrap around your head. for the last flower, choose one with a long stem. add it to the chain, just like you did with all the other ones. 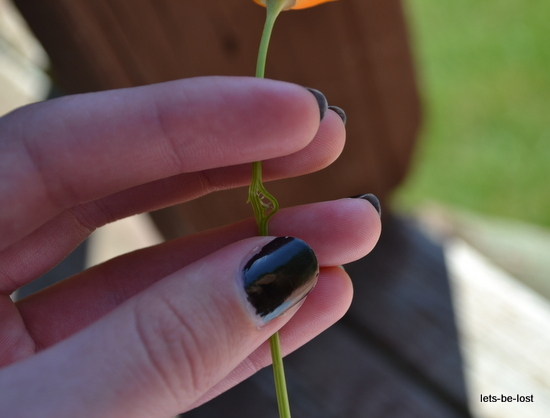 then find the first flower you put on and poke another hole in its stem. 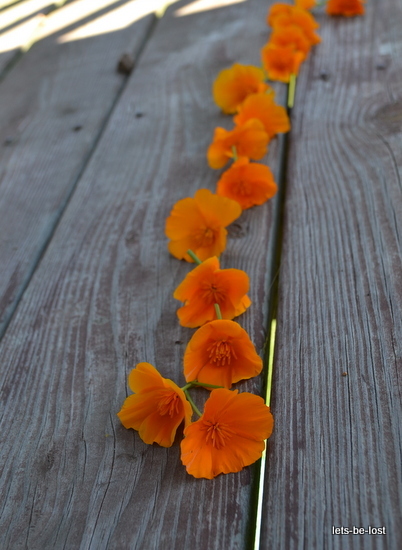 slip the last flower through the hole, joining the ends of the chain. move on to the second flower that you added. make another hole in its stem and tuck the stem of the last flower through it. keep going down the chain, weaving the last flower through the other ones, until the stem runs out. i meant for this post to be up this morning, but i was hanging out with my friend izzy, and i’m just now finding time to write this. we went kayaking, made flower crowns, watched “moana,” went to dairy queen . . . i really love izzy. thank you for all the entries! i didn’t expect to get that many. you guys are amazing. of course, there can only be one winner (though i would send prizes to all of you if i could). 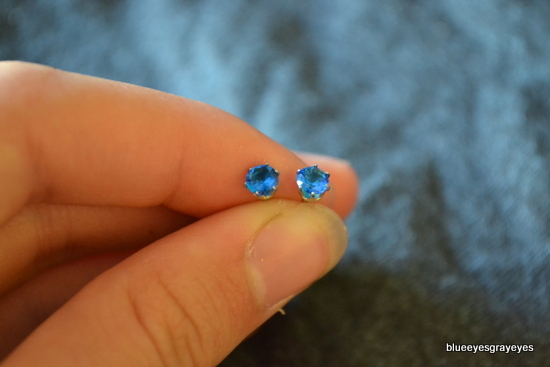 ready to find out who won the twelve pairs of earrings? 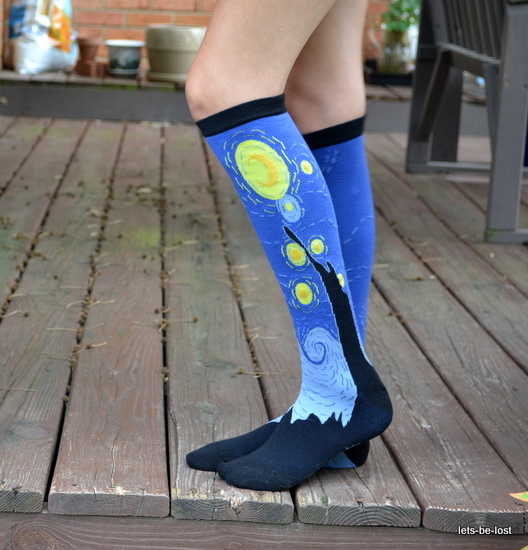 she runs the lovely blog the nerd notebook — which you should definitely check out and follow. so, my dear, i will be sending you an email tomorrow with details on how to claim your prize. if i don’t get a reply by midnight, april 15th, i will have to select a new winner. did anyone catch how i used the winner’s name in the title? i think i’m clever. please be safe, guys. i really love you and i’m glad you’re alive. just so you know, today is the last day to enter my giveaway. 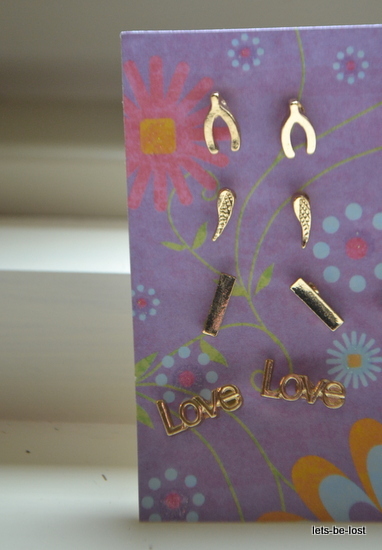 the winner will receive twelve pairs of earrings. make sure to enter before midnight. and there’s still time to get extra entries. you can see all the details here. that’s all I wanted to say, but i don’t want this post to be super short. so i’m going to write about whatever. i thought kellin quinn (from the band sleeping with sirens) was a girl when i first heard him sing. he’s got a freaking amazing voice, though. i was writing down the names of bands i want to listen to. it’s a rather long list. THERE’S JUST TOO MUCH GOOD MUSIC IN THIS WORLD. it’s seventy-four degrees right now and i’m wearing all black: black skinny jeans, black hoodie, black fall out boy shirt. black is just a great color, you know? so comforting. i think that’s all. thanks for reading this rather pointless post. Hey, guys! I’ve got something fun planned for this blog: I’m hosting a giveaway! I should show you what I’m giving away, huh? 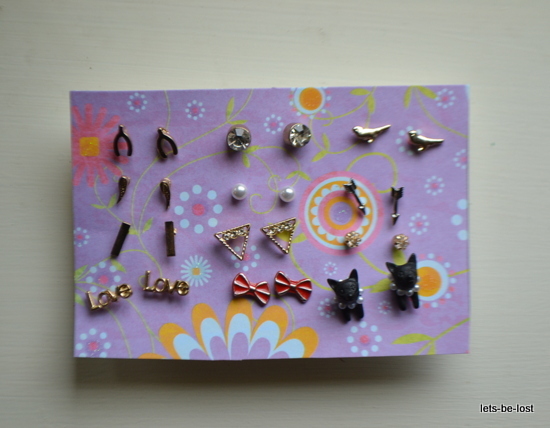 The winner of the giveaway will receive twelve pairs of earrings. They’re pretty much brand new. Each pair has only been worn for about one minute. 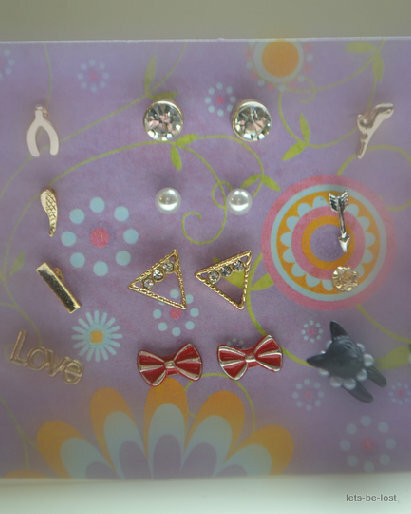 Top to bottom: rhinestones, pearls, triangles, bows. 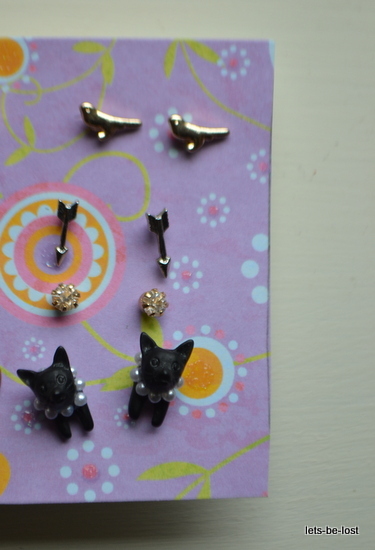 Top to bottom: birds, arrows, small rhinestones, black cats. 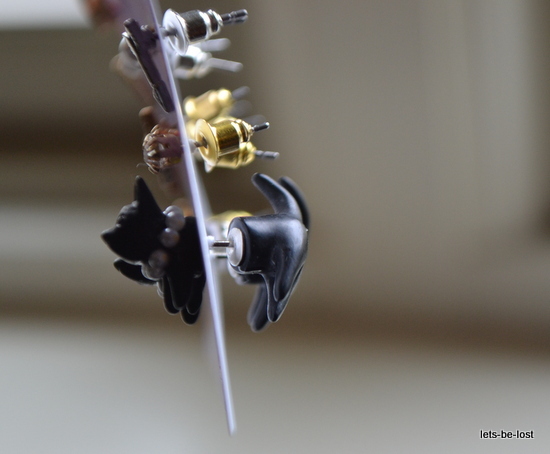 The black cat earrings have the kittens’ tiny lil’ butts instead of normal earring backings, so it looks like the cats are stuck halfway through your ear (which seems a bit twisted, in my opinion. FREE THE KITTIES!). A few of the posts are a little crooked, but you can’t tell once you put them in. Just leave a comment saying you would like to enter. Make sure to get a parent’s permission before entering, because if you win, I’ll need your address to ship the prize to you. 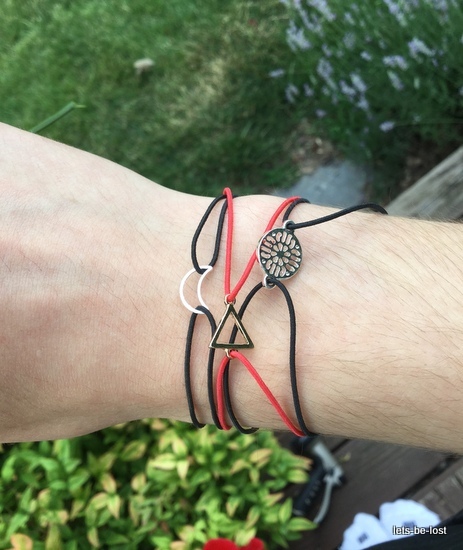 Sorry — this giveaway is only open to residents of the USA. Each of the things above will get you one extra entry. You can only do each of them once (except for the tell-a-friend one — you can do that as many times as you want, but tell a different friend each time). After you do it, leave me a separate comment for each extra entry saying what you did. The last day to enter is April 10th. I ordered some stuff from Hot Topic during their recent sale, and they arrived yesterday! I’m excited to show you what I bought. 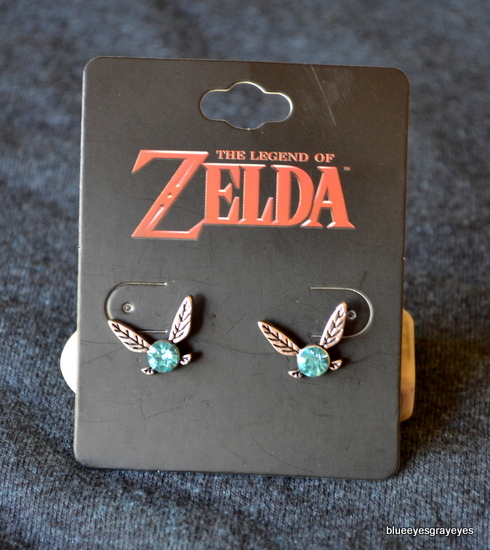 Navi earrings from the Legend of Zelda! They’re super cute, but pretty big. The wings, I mean. They’re rather long. In case anyone doesn’t know who Navi is (in that case, bless you), she is THIS (^^^^^) annoying fairy. She constantly shouts “HEY! Listen!” at you. 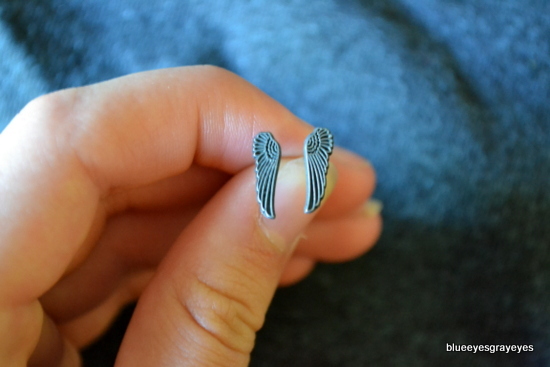 Weeping Angel wings . . . 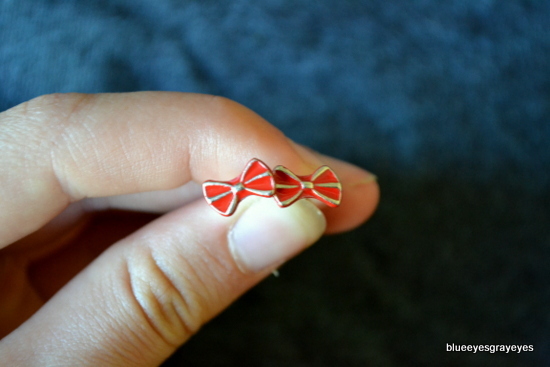 The Eleventh Doctor’s bow tie . . . 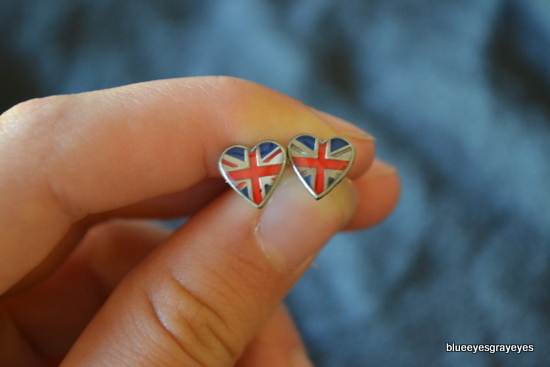 Hearts with the Union Jack on them . 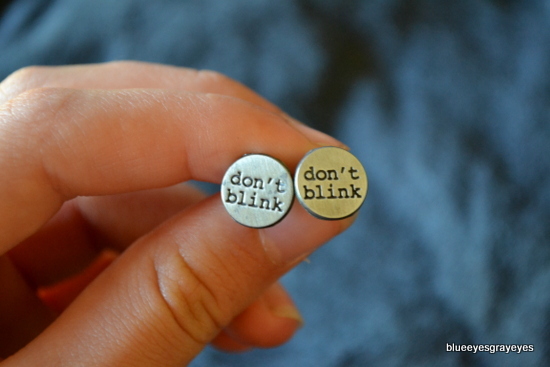 . .
Silver circles with “Don’t blink” written on them . 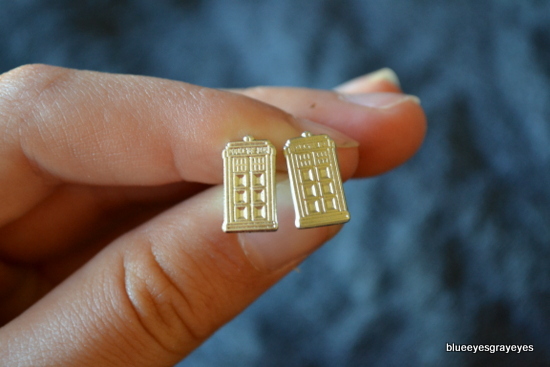 . .
Silver TARDISes . 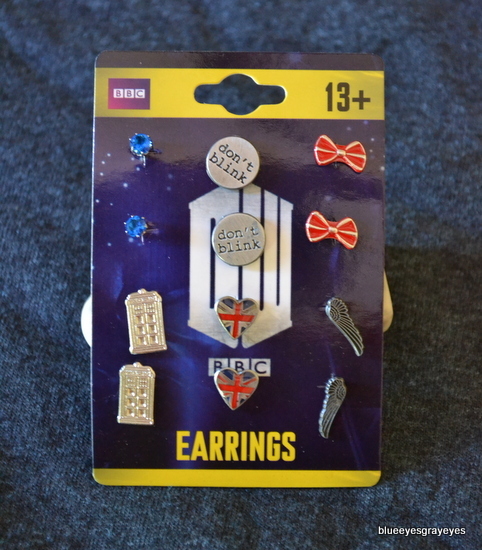 . .
Sure, the blue crystals, angel wings, Union Jacks, and bow ties might look like normal earrings to non-Whovians, but I’m sure that fans of Doctor Who will get the references. I’m a big Doctor Who fan, and I’m really happy to own more fandom merch.